Convergent lady beetles eat aphids voraciously. Lady beetles sold at nurseries for aphid control are convergent lady beetles, named for the converging white marks on its thorax. Suppliers collect beetles from large overwintering aggregations in California's foothills and mountains. Many other species of lady beetles occur naturally in California landscapes but don't aggregate in the mountains and aren't sold commercially. Lady beetles deteriorate rapidly if not handled properly. Lady beetles need to be kept refrigerated until they are released. Live lady beetles on display in stores are attractive for customers, but beetles left out at room temperature rapidly deteriorate. Also, lady beetles are often dehydrated and need water, especially if they have been held at room temperature, even for a few hours. Stores or gardeners are advised to mist lady beetles with water in a squirt bottle before placing them in the refrigerator for storage, making sure not to let water puddle in containers. When purchasing lady beetles, inspect the container and make sure almost all beetles are alive. Lady beetles purchased from primary suppliers (those who obtain beetles directly from collectors) may be healthier than those held in stores for several weeks. Use adequate release rates. UC research shows that high numbers of lady beetles are required to control aphids. One large, heavily infested rose bush in the landscape required two applications of about 1,500 lady beetles each, spaced a week apart. Most packages sold in stores contain only enough lady beetles to treat one aphid-infested shrub or a few small plants. Larger qualities can be purchased from online lady beetle suppliers. Lady beetles need a good supply of aphids. There is no point in releasing them on plants with few aphids. Lady beetles are voracious aphid feeders and an adult beetle will eat 50 or more aphids a day. The convergent lady beetle, which is the species sold for release, feeds almost entirely on aphids and will not remain on plants with low aphid populations and will not control other garden pests. Release lady beetles at dusk or early evening. Lady beetles will fly away almost immediately if released during the heat of the day or where the sun is shining, so wait until evening to release them. Spray a fine mist of water on the plants before the release. Giving beetles a drink may keep them around longer. Place beetles at the base of plants or in the crotches of low branches. Lady beetles will crawl higher into the plant in search of aphids. Once lady beetles begin to fly, they are likely to fly a substantial distance, often outside the boundaries of your garden. Don't release lady beetles on plants that have been sprayed with insecticides. Residues from most insecticides are likely to kill the beetles. However, insecticidal soaps and oils, once dry, won't leave toxic residues. Expect lady beetles to fly away in a few days. Even when released with care, lady beetles will fly away within a few days. About 95 percent of released beetles in research studies flew away within 48 hours. The remainder were gone within 4 or 5 days. Lady beetles are unlikely to lay eggs on the plants they are released on. 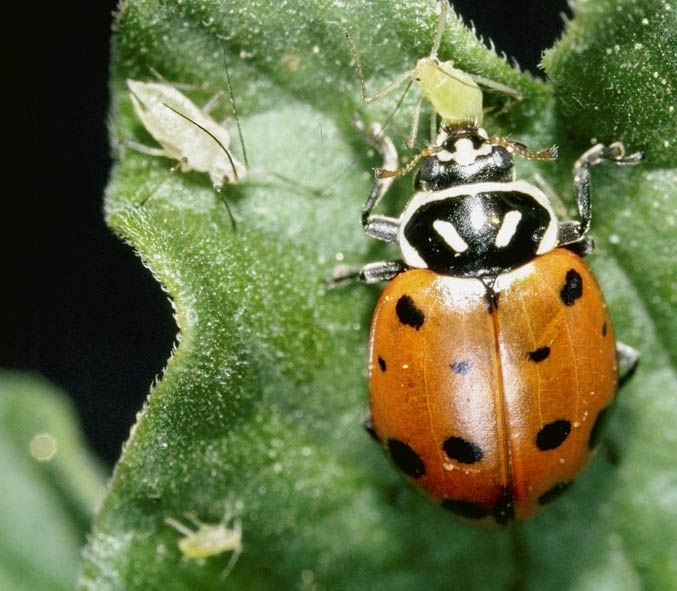 If aphids return a week or two later, gardeners will need to release more lady beetles, hose aphids off with water, use insecticidal soap sprays, or wait for other native aphid natural enemies to fly in. See the convergent lady beetle page in UC IPM's Natural Enemies Gallery for information about its life cycle and view journal articles about UC research on lady beetle releases for controlling aphids. This article was modified from the original version published in the June 2011 issue of the Retail Nursery and Garden Center IPM News. I released some lady bugs I bought at Merced nursery three years ago onto my aphid-laden artemisia plant. The beetle not only stayed but they have been there every year since. Right now there are several stages of life in evidence, most munching on the aphids. Maybe these are not typical ladybugs? If I had an indoor rosebush struggling with aphids would it work to put a glass over the plant to keep the beetles inside and then release them after a few days? I recently treated my garden with a chemical spray to get rid of aphids.Today a friend surprised me with a container of live ladybugs.What can I do to safely use them without the already applied spray killing them? Do I rinse the plants first and wait? I get lady bugs every year a lot of them stick around. They work great and it's a fun event if you hand your helper the container right after you open it. I will never do anything other they work and solve the problem fast. Every year in the past that I've tried ladybugs, they've always flown away. Last year we used ladybugs in a community garden, and not only did they stay on a bed of pea plants, but they started reproducing like crazy, eggs and larvae were everywhere. On top of that, wasps, flies, and a different species of grey ladybug were attracted, and the whole thing became a literal buzzing hive of biodiversity. It was nuts. I have a Linden tree in front of my house that gets aphids each summer. So bad that our cars are covered with their sticky residue every day. We have had days where the windows get stuck and won't go down. Will ladybugs work in a tree? Its a city tree and we cant have it cut down. Roger, you have our sympathies. "No, ladybugs (lady beetles) do not typically eat 100% of the aphids on plants," says Karey Windbiel of UC Integrated Pest Managment." It’s hard to say what type of aphid you have without knowing what trees or plants they are attacking. If they aphids are woolly, it could be the hackberry woolly aphid which you can find out more about at http://ipm.ucanr.edu/PMG/PESTNOTES/pn74111.html . Contact your local UC Master Gardener for help in determining what aphid pest you have and finding the most appropriate and effective solutions. http://mg.ucanr.edu/FindUs/"
Hi Tonya, Karey Windbiel, UC Integrated Pest Management advisor, says "Vinegar is not a treatment recommended by UC IPM for aphid control, so we have no information on how vinegar will affect aphids or the ladybugs (lady beetles) who consume them. Since it is still warm in many areas of California and aphids are still founds on some plants, you could release lady beetles now. However, as we get closer to the winter months, the lady beetles will start to seek overwintering sites and may not stick around to eat the aphids. Read more about aphids and their control at http://ipm.ucanr.edu/PMG/PESTNOTES/pn7404.html or contact your local UC Master Gardener for help in determining what aphid pest you have and finding the most appropriate and effective solutions. http://mg.ucanr.edu/FindUs/"